Public Affairs in the Marketing and Communications office handles all news media inquiries for the campus. Members of the news media are welcome to contact the public affairs staff. Public Affairs provides media and community relations support for the college, working closely with University of Arizona Health Sciences Office of Public Affairs in Tucson. 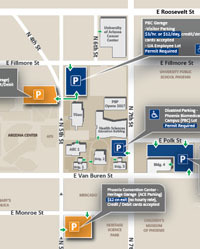 Parking is limited on and around the downtown Phoenix campus. Media parking passes are available to reporters covering news on the UA campus if requested in advance. Contact the Public Affairs office for a parking pass or refer to the campus map. For photos from our outreach events, press conferences and campus growth, check out our Flickr account for a library of professional photos. Our social media sites also have photos. News organizations can shoot photos or video in public areas on the UA downtown Phoenix campus with permission from the Public Affairs office. Media access to University buildings or other locked areas must be coordinated through the Public Affairs office. Call the Public Affairs office, 602-827-2022, to coordinate any commercial filming/taping on campus. College of Medicine – Phoenix (PDF). Center for Simulation and Innovation (PDF). UA Phoenix – A Growing Campus in the Valley (PDF). Banner University Medical Center Partnership Information (PDF).